Astronauts were forced to use knives and shears to carve a gaping hole into the side of the International Space Station to find clues to a mysterious drilled hole that leaked valuable cabin pressure four months ago. 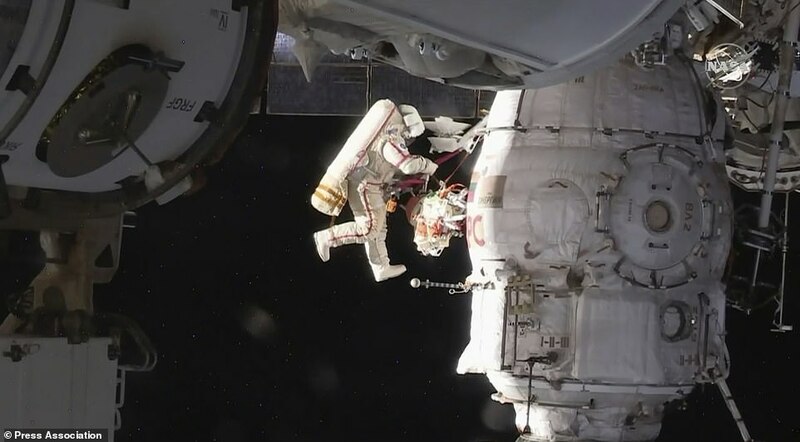 Two Russian cosmonauts – Sergei Prokopyev and Oleg Kononenko – were forced to use an armoury of tools to uncover the source of the leak in a gruelling seven hour, 45 minute spacewalk. Dramatic images and footage show insulation and debris from the spacecraft’s hull floating into space as they hacked into the side of the Soyuz capsule with daggers and garden shear-like devices. Roscosmos, Russia’s space agency, said the aim was to discover whether the ‘small but dangerous’ hole was deliberately caused in an act of ‘sabotage’ or if it had been made in space. The two-millimetre cavity on the Soyuz spaceship docked at the ISS caused an air leak detected in August, two months after the craft’s last voyage. Until Tuesday, astronauts had only been able to examine the hole from inside the spacecraft. Russians Sergei Prokopyev and Oleg Kononenko spotted the tiny hole in the external hull of the Soyuz capsule, more than five hours into their gruelling spacewalk. What made it especially hard is that the Soyuz spacecraft, unlike the ISS, was not designed to be repaired in spacewalks and has no outside railings for astronauts to hold onto. ‘There’s nothing, that’s the problem,’ Mr Kononenko said ahead of the outing.